The Class A was the first of Paxman's horizontal "Fixed" (rather than semi-fixed or semi-portable) steam engines. Of relatively simple construction, they were designed as competitively priced engines with modest power outputs. In their original form they are believed to have been designed for a working pressure of 60 psi although there is documentary evidence (a telegraph code booklet) that later versions were offered which were capable of operating with steam at 120 psi. In 1879 Paxman introduced its more sophisticated and powerful Class B which is described on another page. However the Company continued to make the Class A for many years after the Class B appeared, to meet the needs of customers seeking a simple, compact and inexpensive horizontal fixed engine. Reproduced below are the description and particulars of Class A engines published in the Company's Catalogue No. 32 of June 1883 (pp 32-34). Engines of this Class are made with Single Cylinder, from 4 to 10 nominal Horse-power, and with Double Cylinders from 8 to 20 nominal Horse-power inclusive. 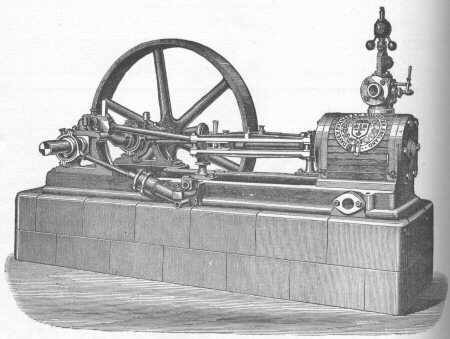 Engraving of a Class A Engine from the June 1883 catalogue. They rest entirely upon a Cast-iron Bed Plate, and can be removed from one place to another without disarranging the parts in any way whatever. This is of much importance to those not occupying their own premises. They are compact, occupy little space, are fixed in a few hours at a trifling cost, and are not likely to get out of order. They are constructed with particular attention to economy, efficiency, and simplicity, and are fitted with all the newest improvements. They are made of the best materials, and the workmanship is of the most finished style. The Joints and Pins are of Cast Steel, case hardened. The price will be found … to be not greater than that of the many rough and inferior Engines in the market. The diameter of the Cylinders also of our Engines is greater than those of the class alluded to. All these Engines are made to work expansively with a single eccentric. The Governors are of a new and improved kind, and the Fly Wheel is turned upon the face to receive a driving band. For small Electric Light Installations these Engines are very suitable. They can be fitted with our variable or Automatic Expansion Gear and Extra Large and Heavy Fly Wheels at an additional cost.